Built in 1877, the Duquesne Incline is a historic cable car railway which serves commuters and tourists. This funicular railway utilizes two original, 1877 cable cars. 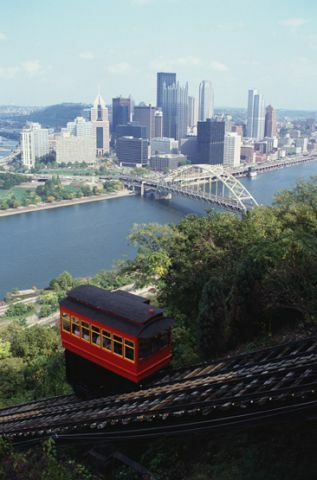 At its Upper Station, visitors may view the Incline's historic hoisting equipment and browse informative displays concerning the history of the Incline and the City of Pittsburgh. • Pennsylvania - Find travel information, maps, tourist resources, and more photos of Pennsylvania. • City of Pittsburgh - Visit the official website for the City of Pittsburgh, PA.
• Pittsburgh Pennsylvania Travel and Shopping Guide - Sponsored by the Greater Pittsburgh Convention and Visitors Bureau. • Pittsburgh Guide - Business directory and maps of Pittsburgh, Pennsylvania.